. . . because great projects begin with great plans. Here's a great guitar rack project for you musicians out there who need to organize your music rooms a bit. It came to me unexpectedly when the worship pastor at my church asked me to build him a rack for holding his instrument cases. He usually has about five or six guitar cases laying around his office and needed someplace to store them. When we talked about materials, he originally wanted it out of plywood. Due to my weird attraction to all the cool melamine colors available, I wanted to build it out of 3/4" Roseburg Graphite Spektrum melamine. I thought the color looked kinda neat with the black guitar cases. Ultimately, price and ease of finishing won out. I built it out of 3/4" black melamine and taped the edges with 0.5mm black PVC edge banding. For a little more money, and to eliminate taping the edges, 3/4" Europly or ApplePly could be used. Both have a really nice edge when sanded smooth. A clear finish (with our without stain) would then be necessary to protect the wood. Cutting the parts is pretty straightforward. I was able to cut everything out of a single sheet of melamine. If you use plywood, it's a little more tricky to get the grain direction going right and still fit it all on one sheet, but it IS possible. The end pieces pose the biggest challenge. You can use a wide range of techniques to cut the angle and radius the two corners. Anything from a hand saw to a CNC router will work. The shop I work in has a CNC router, so that's what I used to cut my end pieces. The CNC machine cuts the entire shape in one pass and the rounded corners turn out WAY better than I could manage by hand. If you don't have immediate access to such equipment, you might try getting in touch with one of the numerous ShopBot owners around the world. I found a guy in my area who was willing to cut all the parts for the guitar rack on his ShopBot CNC machine for less than what I paid for the sheet of melamine. Assembly is very easy if you don't mind visible fasteners through the ends. I think I've mentioned it before, but there are some very attractive fasteners available that really complement the finished piece when left exposed. In this case, screw through the ends into the edges of the front, bottom, and both backs. Also, screw through the front and lower back into the edges of the bottom. Pre-drilling the edges is a MUST and gluing the joints is a good idea too, unless you want to disassemble your guitar case rack in the future. I happened to use a different method of assembly this time because I didn't want to see any exposed fasteners. Recently I had purchased a Kreg Jig guide for drilling pocket holes and wanted to try it out. The results were awesome. I got a bit carried away and probably used too many screws. The manual suggests a pocket screw about every 6 to 8 inches. Mine were probably more like every 3 to 4 inches, but it's definitely not coming apart! Whatever method you choose to assemble your guitar rack, click on the image to the left or just click here to view the plans. If you prefer to download a copy to your computer, right click then "save-as". Either way, you'll need the Adobe reader to view the file. 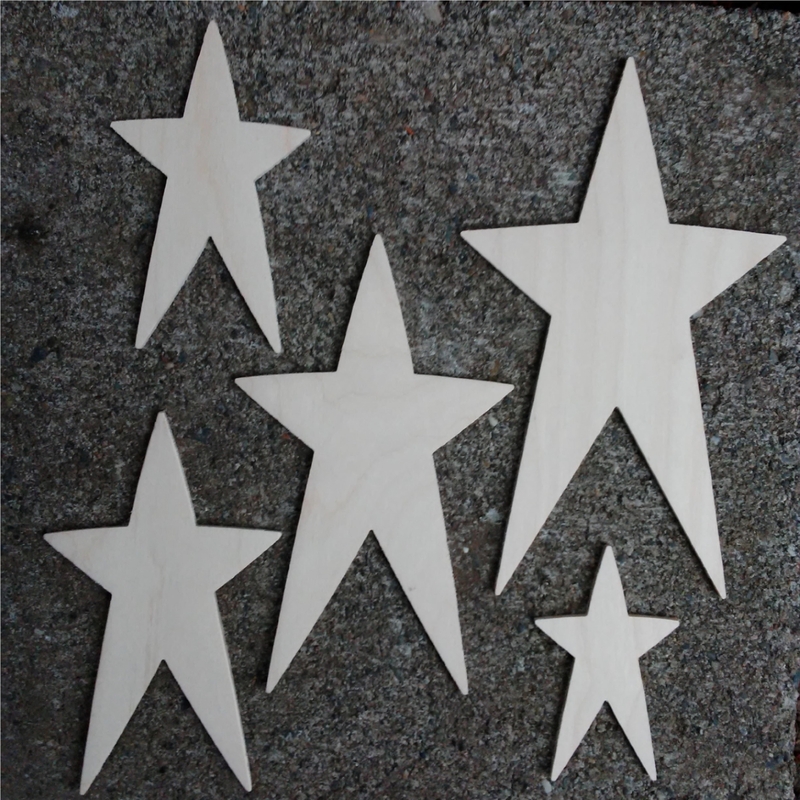 Download or view free wooden star patterns. Includes PDF drawing file. Copyright 2008-2018 totally-free-woodworking-plans.com Powered By Solo Build It!